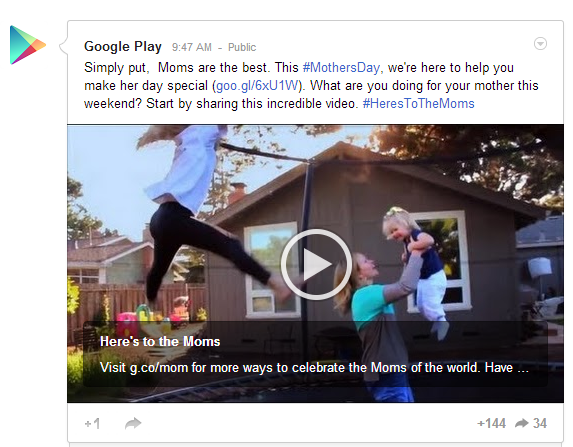 Sunday is Mother’s Day, which not only means that you still have time to pick up gifts for the most important ladies in your life, but also that brands have put their Mother’s Day marketing campaigns into full force across all social networks. In fact, every holiday, event and change of season provides marketers with a timely promotional angle. And naturally, all brands take a different approach in their holiday-related campaigns. For example, a retailer typically promotes products as gift ideas, while content publishers create relevant content or contests to increase engagement. Yet, the best and most complete strategies combine multiple techniques in order to cater to every fan and followers’ preferences. Strategy: Seventh Generation took to Facebook to ask a feel-good question and remind us how important moms are in our lives. 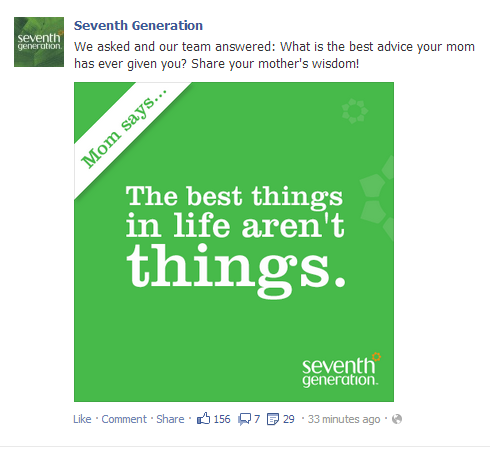 The company’s use of an image to assist in asking the question “What is the best advice your mom has ever given you?” certainly grabs fans’ attention better than a text-based post and most likely leads to better engagement rates. Additionally, these fan interactions help Seventh Generation foster better relationships with its customers, as well as helps to increase brand awareness. Strategy: Retailers and Pinterest go together like peanut butter and jelly, as this social network has proven to drive valuable traffic to e-commerce websites. Beauty company Sephora is taking advantage of this influential social network by creating an entire board devoted to Mother’s Day gift ideas. 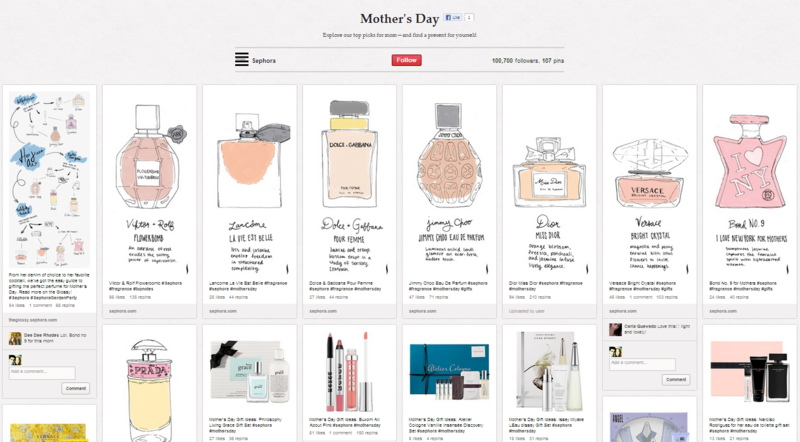 Not only do these featured items take visitors directly to product pages on Sephora's website when clicked on, but many of the images also include the hashtag, #mothersday, in order to increase the product's and Sephora's visibility on the pin boarding social network. Strategy: Giveaways and contests are always a good tactic for increasing your social following, so why not combine these promotions with a timely event? Not only does this strategy from ExtraTV help the brand obtain more followers, but since the company asks for retweets, it also increases their visibility. Plus, this strategy will ultimately leave the two winning followers very happy. Strategy: Another feel-good strategy comes from Google, who has chosen to use Sunday’s holiday as a way to shamelessly promote its very own social network. That said, this video is very relatable (almost a tear-jerker), and truly shows how technology can be used to connect with the most important people in your life. Strategy: Advertisements are always a good way to increase your brand’s visibility, but Beats By Dre takes this strategy a step further by using an interactive and timely Promoted Tweet to reach new audience members. In fact, once someone clicks on the link to make a #Pillconfession (Pill is the name of one the company’s wireless speakers), they are directed to the company’s website where they can explore products and interact with the #Pillconfession campaign by posting a Mother’s Day confession either on Twitter or Facebook. Additionally, visitors can view the confessions of other consumers at the bottom of the webpage, which features an interactive collage of tweets and posts.